showcasing the splendor of a bygone era, this magnificent fort features intricate carvings, and houses the spectacular ‘Sheesh Mahal’ or palace of mirrors, courts of public and private audience, colossal and decorative entrance doors, ornamental pillars, massive ramparts, and galleries. Get a glimpse of the royal lifestyle of the erstwhile Rajput rulers of the city as you walk through arched corridors and see the exquisite artifacts on display. Situated close to the Amer Fort, this for housed the foundry where cannons, guns and ammunition for the royal army were made; many of these are still on dispaly. The world’s largest cannon on wheels (when manufactured in 1720), the Jaivana, is on display – it was fired only once. Built by the Kachchwaha ruler of Jaipur, a greater part of this palace is still in use as a royal residence for the current royal family, though a part of it is now a museum. IT is divided into several smaller buildings, each showcasing a different facet of the erstwhile rulers – clothing, art, weapons, and so on. You can also see the ‘Durbars’ or royal courts – with marble floors, paintings, exquisite lattice-work windows and more. This is a testimony to the wisdom and knowledge of our ancestors. Here you can see various instruments that were erected that still work precisely, telling time, showing the position of stars, constellations and planets, predict the onset of rains and so on. There are detailed explanations of how each instrument works just beside each one. Never fall into the trap of buying from the shops in or just outside the forts and palaces. Regardless of whether you want to buy trinkets for your home, handmade costume jewellery, gold jewellery, brass ornaments, blankets, dress materials, footwear or bangles – head to the local markets in the walled city: Johari Bazaar, Tripolia Bazaar, Chandpol Bazaar, Kishanpol Bazaar and SirehDeori Bazaar are your best bets. Be sure to hone your bargaining skills though! When you’re in Jaipur, you MUST try the sumptuous Rajasthani food: Dal BaatiChurma, crisp, baked wheat dumplings served with a generous dollop of ghee, steaming hot mildly spiced dal(lentils) and sweet crushed wheat cakes – this is the signature food of the state and you must try it at least once. Other delicacies include kersangri – a preparation made of dried berries and beans, lalmaas – meat in spicy red gravy, bajreki roti – flatbread of pearl millet, gate kisabzi – fried gramflour dumplings in a rich gravy, and mouthwatering sweets like gajak – made of sesame seeds and sugar or jaggery with dry fruits, feeni, and ghevar. Spend some quality time with gentle pachyderms, feeding them and riding them – you can event paint on their bodies! Yes, they are that gentle. At the end of the day you can even give the elephant a bath. A unique experience that you will treasure forever. you may be surprised to know that Jaipur offers plenty of adventure activities to visitors. To experience the real flavors, sights and sounds of the city, go on a cycling tour of the city, where you can get up close and personal with the locals and get a taste of the non-touristy Jaipur. To have a bird’s eye-view of the pink city, book a hot air balloon ride. Take plenty of pictures as you float above the city! If you’re a true adrenaline junkie however, you can go a step further: Go on a zip-line adventure in Neemrana. Glance at the city below as you virtually fly across from place to place. If racing or rally driving is your thing, you can go on a Jeep Safari that uses modified jeeps left over from WW II or ATV ride on a 2000 meter off-road track. For some crazy fun, you can even visit the paintball range. Rajasthan is famous for the diverse varieties of puppets that are made, displayed and sold; puppet shows are also held in many places. The local artists are very talented, and these are a delight to watch. 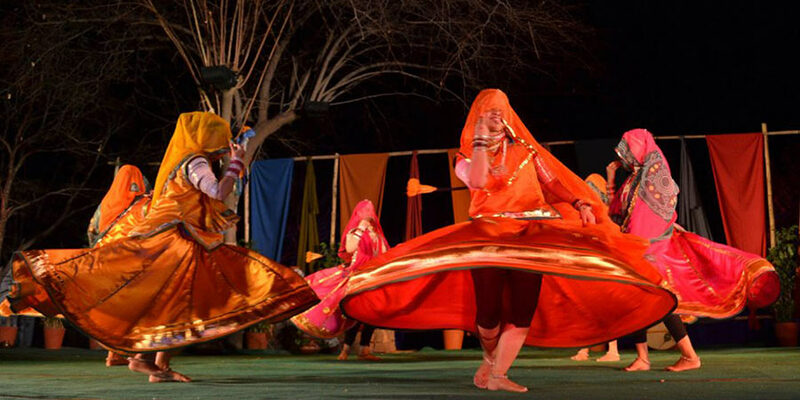 Make sure to keep some time aside to watch local performers doing the ‘Ghoomar’ – the traditional dance of Rajasthan. It’s an absolute delight to watch. I have left out HawaMahal and JalMahal as ‘things to do’ because there is nothing much to do in these places; though spectacularly beautiful, they are just monuments you can see from the outside. The HawaMahal you will see as you drive around in the city and the JalMahal can be seen as you drive to Amer Fort. Hope you liked the post and the places we sugggested in this post. Do you have your own great things that you include in the things to do in Jaipur ? please share below in comment. Rajasthan is a colorful state and include many travel gems for any tourist. Checkout our Colorful Rajasthan tour packages for some exciting rajasthan travel ideas.